My mother was an Avon lady. This was in the late seventies/early eighties, and my sister and I would often go along on her appointments. We'd rate each customer by time spent there leveraged against the snack offered or if they had a cute pet to play with. I paid zero attention to what these ladies bought, whether it was cosmetics, skin cream, or something from the questionable jewelry selection. 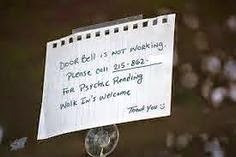 Ding-Dong! I see Avon in my future. I have no recollection of being interested in my mother's makeup though I do remember playing with the tiny white lipstick samples, painting streaks on the webbing of my hand like my mom did to see how the color would look against my skin. Skip forward to high school and my first foray into makeup wearing, which was tragic. Picture a pale child with blue eyes under dirty blond bangs. Now give her some silver eye shadow and tell her to go nuts. You know, really overdo it. Then hand her some teal eyeliner. Let me repeat that: teal. 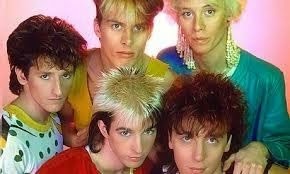 I put the "googoo" in Kajagoogoo. It was very unfortunate. After realizing the horror, I went another direction entirely, eschewing color to only wear heavy black eyeliner for years, like a Goth raccoon. C) too shy, shy, hush, hush, eye to eye? My fear of makeup is only superseded by laziness and so I never really got the hang of applying eye shadow or most other makeup. To add to all my wild and crazy, I've had three hairstyles in my life (but also three colors---if you count highlights as a color). I'm not one for jewelry or perfume either, the latter making me nauseous and/or sneezy. I've never had a pedicure and only had a manicure once, for my wedding, so, basically, I'm not high maintenance in terms of my beauty regimen. Don't worry, as my husband can attest, I make up for this in other ways. It started with lip balm. I'm a lip balm addict, and I think I got her hooked. Once I let her put it on the first time, there was no going back. All my lip balms started to disappear. I'd find the little caps under chairs, open sticks swathed in cat hair. Next, she started "helping" me put makeup on. Handing me mascara and taking away concealer. Soon she was stealing lipstick. I tried to designate one for her use, an old one with a tiny nub left, and I tried to put it on her. But of course she wanted to put it on herself. It's like a scientific law that the messier or more dangerous something is the more a preschooler will express a sudden interest in being independent. Meanwhile God forbid they reach for their own sippy cup a mere two millimeters away if Mommy's at the computer or on the phone. 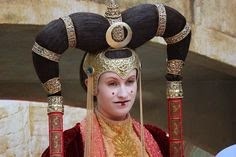 So she took the lipstick, brought it to her face, and completely missed her mouth, putting a smudge above and below her lips like she was Princess Amidala. Shortly after that was the Pink Lip Gloss Incident. She somehow found a tube of pink lip gloss, with glitter, I don't even remember buying. She smuggled it somewhere on her person so when I sat her down for breakfast, thinking I had time to check e-mail while she ate, I was in for a surprise when I turned around to find a tiny individual completely slathered in gloss. All over her face, and up and down her arms and legs. She'd achieved maximum viscosity. 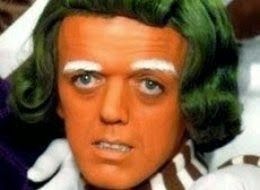 She looked like an Oompa Loompa on Disco Tuesdays. I have the perfect skin cream for you. You look like an Autumn, buy lipstick from me. What price beauty? Somehow all her experimenting doesn't extend to her hair, which she refuses to have brushed or styled. Unless the teacher she has a girl crush on at school does it. I have to chase her around the apartment each morning with a brush and then when I pick her up at day care she's sporting some complicated updo that I have no idea how it could've been accomplished even if Zoe had stayed still and I had three more hands. Speaking of hands, Zoe has had more manicures than me. That's right, two. She loves getting her nails polished. To keep up I've started coloring my nails again. I'm currently wearing a hideous bubblegum pink. If comic sans was a color, it would be this. Guess who picked it out? I suppose I can't blame her since I bought it. A pedicure can't be far behind, which also happens to be where she's going to leave me. No way am I getting a pedicure with my ingrown toenails and Elf Toe Syndrome. How soon will she want to pierce her ears? Her nose? What comes after that? A tattoo? Eyebrow threading? The other day when I was plucking my own eyebrows she asked what I was doing. After I explained, she turned on her heel, splayed out her fingers---decorated with my old rings---and told me that her own eyebrows "are perfect." I had to agree. Who knows what her beauty regimen will be one day. Right now she likes face powder and lip gloss. Her nails polished. Toes polished too under her mismatched shoes. A dog-shaped purse thrown over her shoulder. She's quite the fashion plate. Just don't ask her to comb her hair. This made me laugh. My daughter used to paint her little brother's toes and style his hair, while hers was a rat's nest. These days she has a drawer full of makeup that she rarely wears and at least 50 bottles of nail polish. I'm sure she'll let you borrow a bottle! Ah, the irony. Thanks! Zoe would totally "borrow" your daughter's nail polish. She'll probably return it empty however. hahahh! This is awesome. I took my 3 yr old granddaughter for a pedicure when she was staying with us and she loved it. OMG...I LOVED those little Avon lipstick samples back in the day! Our sweet Avon Lady would leave them for me. Another star is born. LOL. Thanks for commenting, Michelle! HaHa. Yep, definitely cheaper too. I know I've gone into Sephora and MAC stores for my nieces and felt like an alien, but when their lipstick was almost $30 I was like, thanks, I'll stick to my drugstore brands.